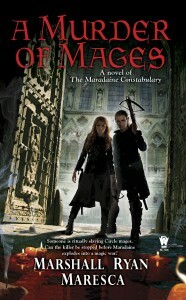 So, this Friday we had the official cover reveal to A MURDER OF MAGES. I have to say, I'm pretty thrilled with the final result. This comes from Paul Young, the same artist who did the cover for THE THORN OF DENTONHILL. Covers, of course, can make a big difference on how the book is perceived. I've heard horror stories about Bad Covers breaking a career before it even gets started. So I've felt particularly blessed with the ones I've gotten. And most of the time, from what I've heard, authors don't get much input. Now, I won't pretend I got a ton of input on either one. I was shown a preliminary version of the MURDER cover several months ago, and on a fundamental level, it was very similar to what you see now. The core image of Satrine framed in the doorway with her crossbow and looking at the pool of blood was there. I was presented a few different choices for the background behind her-- the gothic architecture we see here, as well as a bridgescape and a church interior. All three were really excellent, though the church interior gave a Demon Huntress vibe that I didn't think was accurate. The biggest difference between the final cover and the preliminary is the inclusion of Minox. Since he's as much a protagonist in the book as Satrine, I thought it was key to have him in there. Else the cover become slightly deceptive. I love how the framing and body language shows Satrine and Minox as equal partners, facing the horror in front of them together. In the preliminary image, there was something I had a big problem with-- a minor detail, but it jumped out at me. Satrine was wearing high heeled boots. Hardly a useful fashion choice for chasing murderers on the streets of Maradaine. I expressed my concern, and it was addressed. I think I'm lucky in that regard, that I was able to have input and it was listened to, and in that happening, we have an end result I am proud of. 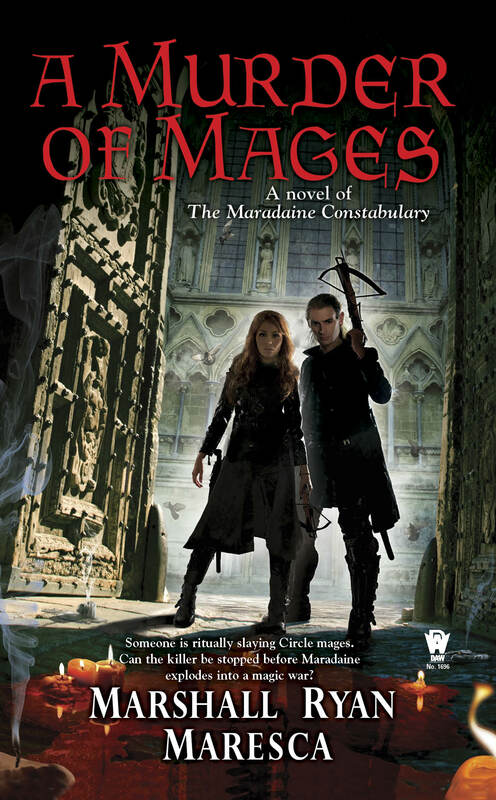 A MURDER OF MAGES is available for preorder on Amazon, and more details are on Goodreads. A Murder of Mages marks the debut of Marshall Ryan Maresca’s novels of The Maradaine Constabulary, his second series set amid the bustling streets and crime-ridden districts of the exotic city called Maradaine. A Murder of Magesintroduces us to this spellbinding port city as seen through the eyes of the people who strive to maintain law and order, the hardworking men and women of the Maradaine Constabulary. Satrine Rainey—former street rat, ex-spy, mother of two, and wife to a Constabulary Inspector who lies on the edge of death, injured in the line of duty—has been forced to fake her way into the post of Constabulary Inspector to support her family. Can't wait to read this one ! I really liked the Thorn of Dentonhill so I will be preordering this one for sure ! Maryam- Excellent! Hope this one holds up.